The true promise of digital signage isn’t to bombard consumers with more content in more places. It’s about replacing traditional printed graphics with smart technology and transforming a passive message into a conversation that encourages consumer participation. Many of today’s screens, however, are just video loops, menu boards, slideshows and weather feeds that don’t encourage the viewer to do anything but watch. Behind every digital sign is a computer that can drive interactive content and deliver smartphone-to-screen connections and more. It’s time to empower the technology to turn inactive viewers into interactive participants. 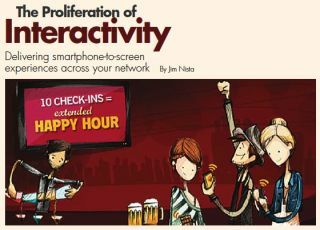 Interactivity is more than just adding a social media feed to the rotation or encouraging people to send a text to the screen. Nearly every company offers some form of Twitter widget or text crawl. Some of it is well done, with a large call to action telling people where to tweet. Like magic, the message appears on the screen, sometimes with impressive filtering to ban offensive words. It’s all very last decade though; once you’ve seen it, the magic is gone. True interactivity means giving the customer a reason to continue interacting. Social media is an excellent way to create conversations with the audience, but it has to go further than just sending a message to the screen. In order to motivate a customer to continue the conversation, there needs to be rewards. Interaction has to be earned. Earning interaction requires giving the audience something fun and rewarding. Entice viewers with a 10-percent discount for sending a message to the screen, and once an hour give one lucky participant a 25-percent discount. Make the interaction a competition. For example, if 10 people “check-in,” a better promotion kicks in. Great interactive experiences allow viewers to connect to the screen directly via their mobile phone and using mobile Web standards so anyone can participate. Interactivity is not about using the latest and greatest technology. Use what works now: Web, text, social and email; use whatever customers have in their pocket. Don’t make viewers download an app or scan complicated codes. Make it something the least tech-savvy person could do in seconds. Every additional step translates directly to lower engagement rates. Keep is simple and offer multiple methods to connect. Allow interaction via email, text, Web, Twitter and Facebook, to give participants the choice they feel most comfortable with. Most importantly, respond to those who took the time to interact. All of the major social media networks have powerful APIs, allowing programmers to not only capture a social shout-out on a digital sign, but to thank the user. The experience must extend beyond the screen. For your client, the true benefit beyond creating an experience for customers is the analytics you get back. Interaction creates an undeniable metric, exact tracking of the number of viewers who visited a website or texted back your code. The client site also gains valuable marketing data, such as email addresses or mobile numbers, allowing them to continue promotions to that viewer. It’s time to leverage the power of the computer behind the screen to deliver rich experiences everywhere, including displays that traditionally have been information only. From the airport flight status screen to the quick-service menu board, smartphone-to-screen connections over social and Web standards deliver measurable customer activity and build brand experiences our clients will want to invest in.